At first glance smoking a cigar may seem like a simple enough task, much like a cigarette, you light it and smoke. There are certain nuances and conventions however that makes smoking a cigar far different than smoking a simple cigarette. Smoking a cigar is more about experience than anything and here are a few different steps that can help you enjoy your cigar and look like a complete professional doing it. The first step to smoking a cigar is to choose the right one for you. There are a few different types that are fairly common such as Robusto, Belicoso, Panetela, Churchill, Lonsdale, and Corona. Each of these cigars has a different flavor profile and is packed differently. It is important to choose a cigar based on three different factors, first, size. The right size cigar will fit in your hand and your mouth and will be enjoyable and not unmanageable. You also want to keep the feeling of the cigar in mind as well, if the cigar is soft, you want to avoid it. You should be looking for a cigar that is firm throughout. Though it may seem strange, the size of a cigar can have a tremendous impact on how much the smoker enjoys the experience. You then want to consider the flavor. There are straightforward cigars that are nothing more than tobacco and that have been created to preserve the taste of the tobacco itself, there are also those that are soaked in other flavors to give a truly unique experience. You want to make sure you know what flavor you are looking for so that you can find the right cigar for you. Lastly, you want to think about price. The most expensive cigar is not necessarily the best. Take the time to talk with the Burn & Brew employees to find the perfect cigar for you. The next step after selection is to cut your cigar properly. Unlike cigarettes, most cigars need to be cut. Your cigar will not properly light if it is not cut to expose the tobacco within. Cigars are rolled so that they are tucked firmly together to prevent loss of flavor. Cutting allows for access to the inner tobacco where the flavor is. The ideal tool for cutting a cigar is to use a cigar clipper. Cigar clippers allow for a swift and full cut so that there are no jagged edges and so that the cigar is not crushed. You want to clip in a very quick motion that does not allow the cigar to be crushed and that cut through it fully. If you do not have a cigar cutter, you can use a knife to cut it but a cigar cutter is ideal. Lighting your cigar is the next step. You can use a variety of different types of lighters to light your cigar but torch lighters are the best for beginners. You want to hold the tip of the cigar above the flame, not placing it directly in the flame. Some experts claim that placing the cigar directly in the flame will alter the flavor. You should place the cigar above the flame and puff gently to allow oxygen to the flame to help light. You want to rotate and move the end of the cigar around so that it is lit evenly and will therefore burn down evenly. 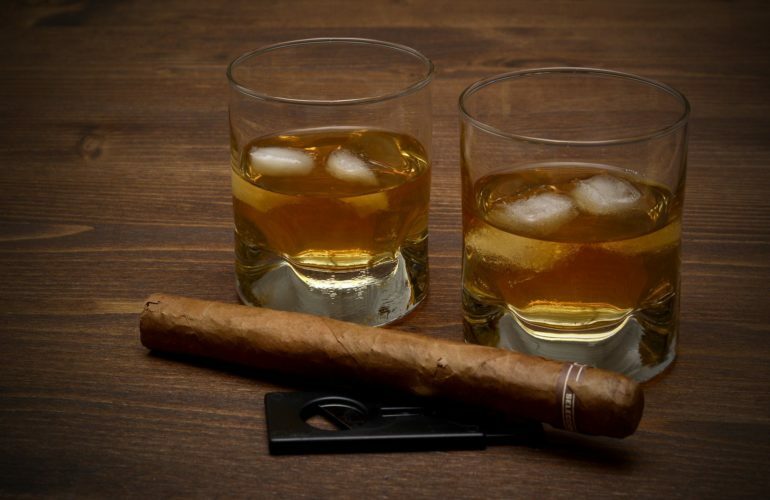 After that, you want to watch for an orange glow at the end of the cigar so that you can begin to smoke it. If you do not have a torch lighter handy you can use a wooden match but they are harder to keep lit long enough to light the cigar fully. If you are an experienced smoker you may be able to use matches but overall a torch lighter is best for beginners. Experts also claim that normal lighters are to be avoided as they can change the flavor of the cigar as well. The last step it so smoke. This is a simple enough process, you want to puff, not fully inhale. If you do inhale the smoke fully you are likely going to choke on the smoke. You want to puff and draw the smoke into your mouth to enjoy the flavor only, not to actually bring the smoke into the lungs as you would with a cigarette. Puffing a few times quickly when you first start will help to get the cigar evenly lit. after you have it evenly lit and you have smoked it down some, you can simply take a puff every few minutes to simply enjoy the flavor.